Named the ‘Cape of Storms’ by Bartolomeu Dias in 1488; the ‘Point’ was treated with respect by sailors for centuries. By day, it was a navigational landmark and by night, and in fog, it was a menace beset by violent storms and dangerous rocks that over the centuries littered shipwrecks around the coastline. In 1859 the first lighthouse was completed; it still stands at 238 metres above sea-level on the highest section of the peak and is now used as the centralised monitoring point for all the lighthouses on the coast of South Africa. Access to this historical building is by an exhilarating three-minute ride in the wheelchair-accessible Flying Dutchman funicular that transfers visitors from the lower station at 127 metres above sea-level, to the upper station. Cape Point is in the Cape of Good Hope nature reserve within Table Mountain National Park, which forms part of the Cape Floral Region, a World Heritage Site. It includes the majestic Table Mountain chain, which stretches from Signal Hill to Cape Point, and the coastlines of the Cape Peninsula. This narrow stretch of land, dotted with beautiful valleys, bays and beaches, contains a mix of extraordinarily diverse and unique fauna and flora. There’s a lifetime of things to see and do at Cape Point, from the most spectacular viewpoints to the most isolated and serene beaches, and it’s impossible to fit them all in to a single visit. See our top favourite things for you to do when you’re at Cape Point, and to encourage you to return for more! Take in some of the most breathtaking ocean and mountain scenery in the world. Ride the Flying Dutchman Funicular up to the viewing point, below the old lighthouse. Sample world-class cuisine and enjoy the most spectacular vistas over False Bay at the Two Oceans Restaurant. Shop for curios and mementos at the three Cape Point shops. Discover cultural and historical spots, including monuments to explorers such as Vasco da Gama and Bartolomeu Dias. Great swimming spots, picnic sites and walks at the Bordjiesrif and Buffels Bay tidal pools. Photograph the more than 1 100 indigenous plant species that grow nowhere else in the world. Watch massive whales moving past Cape Point on their annual migration (around June to October) . Keep an eye out for 250 bird species occurring here, including some endemic to the area. Spot the Cape mountain zebra and the world’s largest antelope, the eland, among a variety of other fauna. 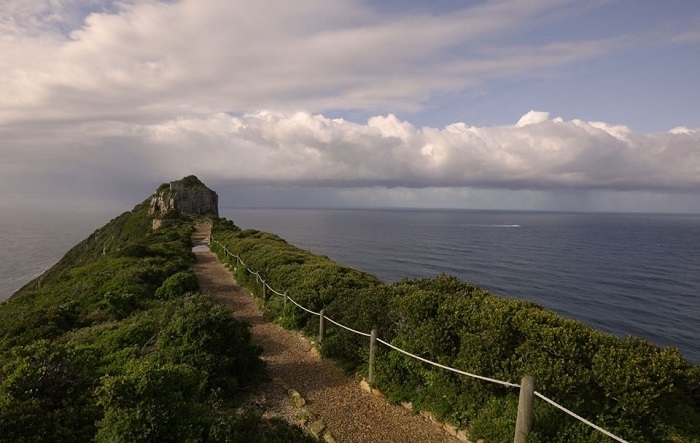 Walk the shipwreck trail to view a few of the 26 recorded shipwrecks around Cape Point. Hike along a wide variety of scenic and overnight trails through natural fynbos and along sandy beaches. Take part in a range of exciting outdoor activities, such as sea kayaking and mountain biking. Explore a wide variety of stunning dive sites that lie waiting to be explored on both sides of the Point. Always keep a lookout for the legendary ghost ship – The Flying Dutchman! Rugged rocks and sheer cliffs towering more than 200 metres above the sea and cutting deep into the ocean, provide a spectacular background for the Park’s rich bio-diversity.